Reflections was created for the MakeFashion 2015 Gala as a tech couture design suitable for formal or cocktail events. It is an historically informed modern take on the cocktail dress. 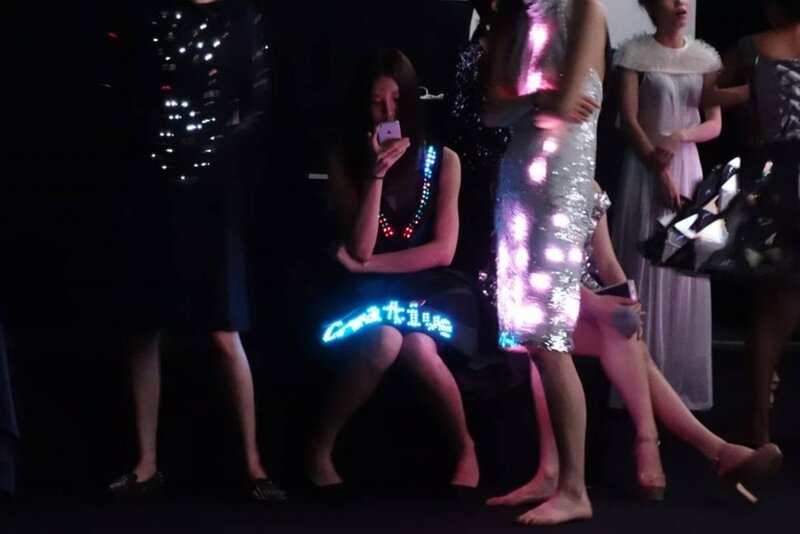 The dress reflects thoughts and emotions on LED matrix displays using a bluetooth connection and a smart phone app. The dress is made of silk and is composed of two pieces: the cocktail dress and the hoop skirt. Both parts contain their own electrical systems. The electronics are removable so that the dress can be dry cleaned. The Reflections dress even has it's own hashtag! The Reflections runway debut during the Make Fashion Gala March 28 2015 at TELUS Spark Science Centre in Calgary AB. Accentuating the design lines of the bodice, programmable LED strips run a constantly changing generative animation based on the doppler redshift. It is never the same twice. The skirt reflects the thoughts and emotions on LED matrix displays using a bluetooth connection and a smart phone app.